Antonio Graceffo, Khun Khmer: Cambodian Martial Art Diary (VMA Publications, 2011). American author Antonio Graceffo traverses Cambodia to reveal Bokator in Khun Khmer: Cambodian Martial Arts Diary. Graceffo’s 7th book is an in-depth look at an indigenous fighting art once feared lost forever. In his quest to provide the most detailed publication on Bokator, as well as Bradal Serey (kickboxing) and Japbap Boran Khmer (wrestling), Antonio takes readers through every sparring session with past heroes and future prodigies of this unique fighting art. While much of the book concentrates on the art of Bokator, it also pays tribute to the individuals who have influenced Antonio throughout his sojourn, acknowledging the tireless efforts of individuals who have fought hard for many years to allow locals mired in poverty to have dignity. His perilous efforts in tracking down teachers and devoted practitioners, as well as meeting with memorable individuals and recounting less savory aspects of the poverty faced throughout the country, is what makes this book enjoyable. Antonio’s meeting with instructor Grand Master San Kim Saen, one of the few men who survived the Khmer Rouge’s purge, and Aki Ra, the one-man NGO landmine remover, are among the highlights. The hours of training for professional fights and on-camera appearances with martial arts practitioners and future prodigies battling to earn for living each day gives Graceffo’s account a distinct edge. Cambodia is a country not for the faint-hearted, and what we learn is that moments of frustration of frustration and inspiration can shift as often as the wind changes direction. But this is why Graceffo appears to love the country so much, because his limits are constantly tested, both inside and outside of the fighting arena, and he is never one to back away from a challenge. As with his previous books, Antonio does not hold back when faced with confronting questions, such as the sensitive issue over the true whether Thailand or Cambodia claim rights to a martial art practiced, when explaining the link between the martial arts, unique characters he interviews and the grinding poverty endured by Bokator students, providing context the horrible impact of Cambodia’s civil war and how the country is still haunted today by its aftermath, or why a hospital worker charges $40 per night to keep a dead body safely stored in a hospital for identification by consulate officials. 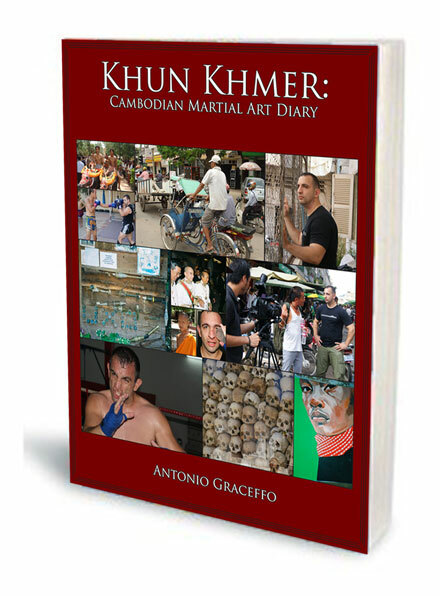 Not only does this book have the potential to spark a surge in interest and participation in Bokator, Khun Khmer: Cambodian Martial Art Diary may prove to be Antonio Graceffo’s magnum opus for unearthing a treasure once feared lost. The moments of frustration and anger in the text are a reminder of how passionate Graceffo is about training and self-improvement, and showcasing another highlight of Cambodia, the land that has become a home away from home for the author. Graceffo’s insights are hard-hitting and provide the perfect backdrop to cheer on underdog combatants. This is a tough environment where fighting has long been a national currency, but Graceffo ultimately makes us all feel comfortable in a land with a proud tradition in Bokator. Hopefully it will soon unearth a new breed of Cambodian ambassadors and champions.